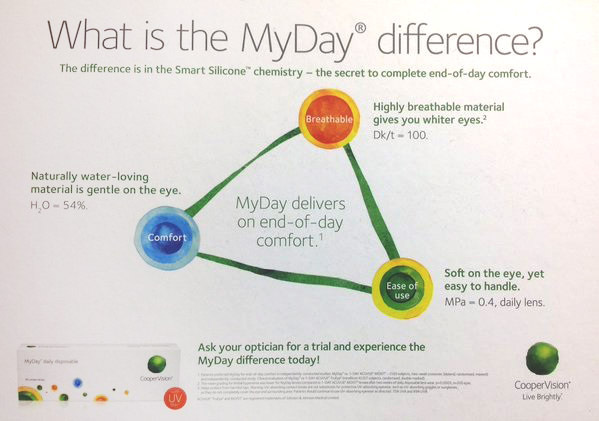 MyDay is the newest lens developed by CooperVision and it was designed to be a lens that bridges the gap between comfort and and breath-ability. Before daily disposables were first introduced, we had monthly and yearly lenses made of special types of plastic known as hydrogels. These hydrogels were very comfortable on the eyes, but did not allow much oxygen through them. Then in the 2000s came a breakthrough in contact lens breath-ability. Researchers found that by infusing the ingredient silicone to the traditional hydrogel material, contact lenses become a lot more permeable to oxygen. This allowed the eyes to receive an abundance of oxygen despite long hour of contact lens wear. However, it turned out that although adding silicone helped make the lenses more breathable, it also made them stiffer and less comfortable to wear. performed when it came to comfort. 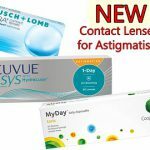 It was not until the mid 2010’s that breakthroughs in technology allowed contact lens manufacturers to solve this dilemma, and create products that delivered on both comfort and breath-ability. The first lens to do this was Dailies TOTAL1 by Alcon. This remains one of the most comfortable and breathable lens on the market, however, its high price meant that it didn’t make it onto very many people’s eyes. Next to break through was the Bausch + Lomb ULTRA lens. 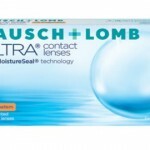 In my opinion this is the best all around lens on the market, however, it’s a monthly lens, so for those daily contact lens wearers, there still wasn’t a great product out there for them. Until now of course, because the CooperVision MyDay lens fills that need perfectly. 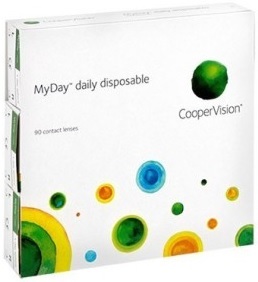 The MyDay lens is a premium daily lens that delivers all day comfort while at the same time provides ample amount of oxygen to your eyes to keep them comfortable and healthy. High Water Content. MyDay lenses have a 54% water content, and the material is naturally wettable, that means it doesn’t need an additional surface coating to keep the lens wet. Optimum Silicone Concentration. Adding too much silicone to the lenses makes them stiff and uncomfortable. MyDay still has enough silicone to makes the lenses extremely breathable, but less than some older brands that struggled to provide good comfort. Ideal Modulus. The Modulus is a measure of how stiff a lens is. If a lens is too stiff it will be uncomfortable, if it is not stiff enough, it will be difficult to insert and won’t stay on your eye. MyDay has struck the perfect balance. Chemistry. 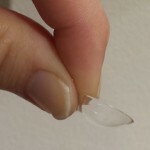 They developed silicone channels that allows the contact lens to breath better without having to put in nearly as much silicone. As a result of this, the MyDay lens eliminate the historical trade-off between comfort and breath-ability that most other lenses have. Being a very new product, the MyDay lens has a few limitations. Currently, it only has a spherical version (there is no astigmatism version). 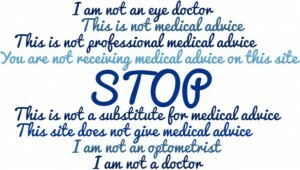 That means that in order to benefit from the MyDay lens, you must have a very simple prescription. Depending on where you live, MyDay may only be available in 90 packs. There are no 30 packs available, meaning that if you just wanted to buy a small supply for occasional use, you will have to buy the larger 90 packs which may take you a while to use up. Does not compromise on softness or breath-ability to give you comfortable all day wear. Blocks UV rays and protects your eyes from damage and pre-mature aging. Gives you the convenience and health benefits of a daily disposable lens so you can completely forget about cleaning and storing your lenses at the end of the day. 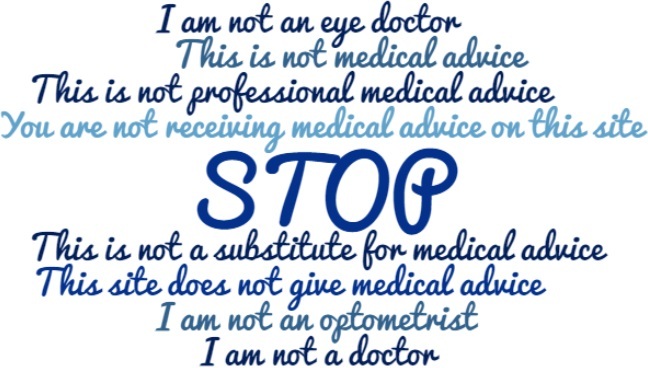 If you think MyDay lenses would be a good fit for you, discuss it with your eye doctor. When Is It Time To Change Contact Lens Brands?